Become Career » How Do I Become a Veterinarian? Do you have a love for animals and a passion for helping animals feel healthy and happy? If so, you may want to consider becoming a veterinarian. Continue reading and get the facts on what it takes to become a veterinarian. What Training is Required to Become a Veterinarian? To become a veterinarian, you must earn the Doctor of Veterinary Medicine (D.V.M.) credential, which takes several years of education and study. At the very least, you must complete an approved four-year veterinary program; the first three years include didactic studies and clinical rotations with the final year spent completing an internship in a veterinary clinic or hospital. Students interested in specialized areas will need to complete additional education. Although it’s not a requirement, it’s recommended that applicants already have a bachelor’s degree prior to starting the veterinary program. Currently, there are 29 accredited schools offering veterinary programs. 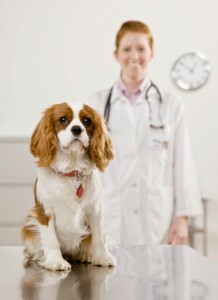 In order to work as a veterinarian, you must be licensed in all states as well as the District of Columbia. Although each state may vary in their licensing requirements, most states require that you complete an approved veterinary training program and pass the North American Veterinary Licensing Examination (NAVLE), which is authorized by the National Board of Medical Examiners. Additionally, you must apply for licensure with your state veterinary board. You may also be required to take a state exam as well as the national exam, depending on your state. Licenses must be renewed every couple of years. If you choose to focus your study on specialized areas of veterinary medicine, you can also obtain certification in these areas by passing certification exams through the American Veterinary Medical Association or the American Board of Veterinary Practitioners and completing the required training for the respective specialties. Veterinarians who are certified have earned the credential of “Board Certified” or “Diplomat” by their certifying agency. Continuing education credits are required to remain certified; however, the number of credit required varies depending on the certification. Continuing education is also required to maintain licensure. This also is dependent on the state in which you’re working. For instance, Wisconsin requires that their veterinarians complete at least 30 hours of continuing education every two years. New York, on the other hand, requires 45 hours every three years. What is the Career Outlook for Veterinarians? The increasing number of laws regarding animal welfare, along with pets having a more active role within the family, has put a demand for licensed veterinarians. The U.S. Bureau of Labor Statistics (BLS) reports that veterinarians should see an employment growth of 12% between 2012 and 2020. As of May 2013, the annual average wage for veterinarians was $86,640. Factors that could affect wage include location and number of certifications. Entry into an approved veterinary program is very competitive, with only about 50% of applicants accepted each year. If you know this is your dream, check into some schools today so you don’t lose an opportunity to become a veterinarian and devote your career to helping animals.